Lung cancer has a way of staying hidden and becoming increasingly fatal the longer it does so. However, there are enormous benefits to shining light on this particular cancer early on, and that’s more possible now than it used to be. Early detection, which is crucial in all cases of cancer, gives patients options they otherwise wouldn’t have since the disease may be smaller in size and hasn’t metastasized to other regions of the body. However, identifying lung cancer in its beginning stages can have an even more distinguishable impact on survival when compared to other types. Since lung cancer stands out due to its prevalence (second-most common type), mortality (deadliest type) and tendency to fly under the radar, early detection is vital with this disease. One of the reasons why lung cancer is the deadliest type of cancer for both men and women in the United States is the fact that symptoms don’t emerge until the disease has reached an advanced, non-curable stage. Only then does the patient begin to experience a cough that is persistent, progressive or even bloody. Other symptoms come in the form of chest pain, difficulty breathing or infections such as bronchitis or pneumonia. Even when these things show up, they’re commonly confused with the side effects of smoking or another sickness. The lack of warning signs makes it important for patients to be proactive in getting yearly screenings. Those at high risk — individuals who smoke, inhale secondhand smoke, get exposed to high radon levels or other substances, or those with a family history of lung cancer — should get their lungs checked on a regular basis. Time is a critical factor when it comes to those with lung cancer, which has a five-year relative survival rate of 18.7 percent, according to the latest annual report to the nation on the status of cancer. That percentage is lower than any form of cancer listed in the report from 2006-12, with the exceptions being pancreatic cancer (8.5 percent) and liver cancer (18.1 percent). These statistics can vary a great deal depending on the type and stage of the lung cancer. With that said, screening that leads to early detection while it’s still localized within the lungs can increase the five-year survival rate to about 56 percent. In some cases, catching the disease in its earliest stages can have a striking effect. For example, detecting non-small cell lung cancer (by far the most common type) at stage IA1 has a five-year survival rate of 92 percent. At the UF Health Lung Cancer Program, 9 out of 10 lung cancer referrals are seen within seven days. That accessibility is key to giving our patients the best possible chance in the battle. When it comes to those checkups, there hasn’t been a widely accepted screening tool available for early-stage lung cancer until recently. 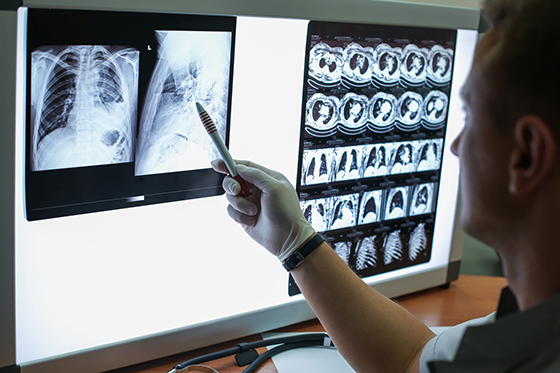 Far too often, regular chest X-rays have missed lung tumors during the most beneficial time to be a reliable method for detection. Supported by the National Lung Screening Trial (NLST) and the American Society of Clinical Oncologists, along with many studies, low-dose computed tomography (LDCT) has proven to be more effective at detection than chest X-rays for those at high risk. Unlike the single-picture chest X-ray, the multi-picture CT scan uses detailed cross-sectional images of the body. The CT scanner does this by rotating around you while you lie on a table and taking several X-rays. The LDCT scan’s superior ability to uncover lung tumors, even small lesions that could potentially carry cancer, is a key reason the NLST and other research has shown that getting annual LDCT scans before symptoms appear can help reduce the risk of dying from lung cancer. Please ask your primary physician for more info and to schedule an appointment if necessary.